Why Does the Colour of Your Beer Bottle Matter? 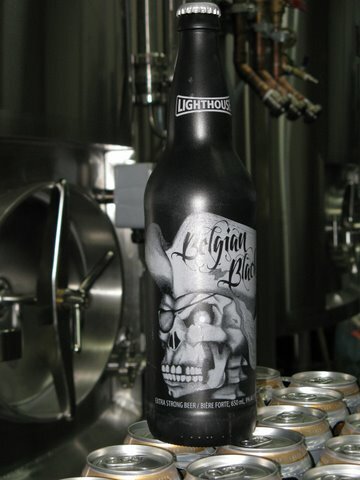 Photo courtesy of Lighthouse Brewing. If you’re a brewmaster making beer for the enjoyment of others, the ingredients and process you use are paramount. Quality control is one of the main concerns for beer drinkers who desire consistency with every pint. Regardless if you like Budweiser or not, no one debates that they have quality control mastered, as you always know how your beer will taste. One of the key factors in this consistency is the colour of their bottles. The two biggest issues to affect your beer once bottled are light and temperature. Either of these can significantly affect the flavour of your beer, especially the former. This is why you see beer nerds cringe when they watch a beer commercial that shows open beer in the sun. Two seconds of direct sunlight will “burn” or “lightstruck” the beer, making it taste off. This is because light, especially ultra-violet (UV) light, causes an instant reaction, changing the iso-α-acid to 3-methylbut-2-ene-1-thiol. If this sounds nasty, it is! The “thiol” change means sulphur. And even the smallest amount of sulphur, like one part per billion, will make your beer taste skunky. This is why beer bottles are typically brown. They’re created specifically as a UV filter to protect your beer. Regular brown beer bottles don’t fully protect your beer, so you should still try to keep even a UV bottle our of the light. On the Brews Traveller Map? Granville Island Brewing was one of the sponsors of the Culinary Tourism Society BC Conference. I recently attended a culinary tourism conference at The Sutton Place Hotel put on by the Culinary Tourism Society BC. This is one of the fastest growing segments in global tourism, but BC is still a ways off from achieving its full potential. A lack of budget, co-operation, and co-ordination is holding us back. This is also true when it comes to BC craft beer and the tourist. What are the chances that a visitor will only drink Canadian, Keith’s, Kokanee, Sleeman, or even Bud their whole time here? Given that these are amongst the top ten selling beer brands in the province, chances are great. Even beer aficionados have trouble finding convenient, comprehensive, up-to-date information. I just received an e-mail today from someone in Honolulu, asking what BC beers I would recommend his colleague bring back from a visit to Vancouver in the next few days. I have also gotten e-mails from CAMRA UK members looking for Real Ale. It shouldn’t be this hard. While many individual craft brewers don’t have a lot of money for marketing, never mind the time to implement promotional activities, the word still has to get out somehow. It is harder to do this on an individual basis with a limited budget. This is why American craft brewers formed associations and guilds, pooling their resources by collaborating, not competing against each other. In BC, we’re still working on this primary step. Meanwhile, the World Police & Fire Games are coming this year and the Olympics in 2010. Have the craft brewers organized the means to make the participants and spectators aware of their beer? What about a BC craft beer mixed pack that visitors can buy as a souvenir or as a gift for their beer-loving friends back home? Have the brewpubs and craft beer-friendly establishments come up with a handy reference that tourists can easily carry with them? Sporting events, holidays, and festivals, however, are fleeting events. Erik Wolf, President and CEO of the International Culinary Tourism Association, one of the conference speakers, reiterated the importance of collaboration when faced with limited funds. He also emphasized the point of turning locals into ambassadors. Early adopters, if they enthusiastically embrace a product, will evangelize it for free. If craft brewers more closely involved their closest followers in product testing, events, etc., their promotional reach would extend much further and be more readily accepted, coming from friends or family members. In Washington and Oregon, the brewers guilds actually have their supporters organized — WABL, SNOB. To be on the brews traveller map, B.C. doesn’t necessarily need to do anything that costs a lot of money. What money we do have, should be invested in those channels that are the most cost-effective, have the greatest reach, and achieve sustained exposure for locals and visitors.